PLEASE REMOVE YOUR PROPS BEFORE TRYING ANYTHING !!! Considerable time and effort was spent coming up with this Taranis configuration. The simple goal was to handle all the primary and not so primary functions that I find useful. I'm hoping most folks will find it useful as well. If it doesn't quite fit your usage scenario then maybe it will serve as a good starting point for your own custom config. - Custom sound files provided for all the switches, and warnings, etc..
You should know how to install an .eepe model file and push it to the Taranis. You should know how to configure Cleanflight as well. I'm not saying that a newbie can't get this to work but it would be very helpful to be familiar with these components and their configuration software. This Taranis configuration will only function "out of the box" if you are running the NAZE32 controller board running Cleanflight 1.8.1 firmware (or greater? ), FrSky D4RII receiver using PPM, and a carefully setup Cleanflight configuration (included mine for reference). 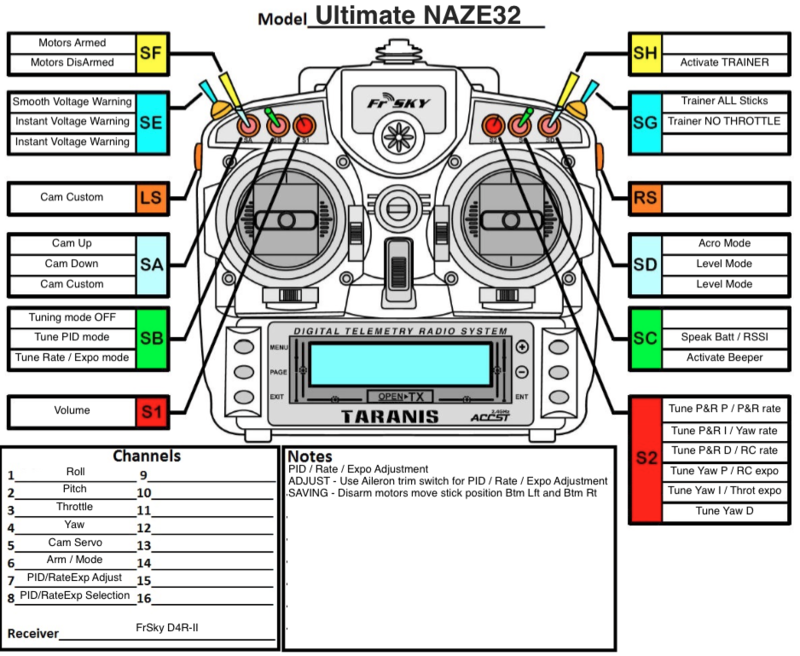 In order to for this Taranis config to work without modification you will need to make certain that AUX and ADJUST ranges and channels match my configuration exactly. I've provided a full cli dump of the entire cleanflight configuration for your reference. Much gnashing of teeth has been had here as some channel(s) had to be shared between the arming and tuning functions as necessary due to limited channels. Don't worry it works BUT you have to get it right! I've included ALL of the custom sounds I've generated since I've had the Taranis. There are many more files here than needed for this model. It won't hurt to install more files than needed AND you might even be able to use a few of them for your own custom sounds. Just copy the sound files to your Taranis SD card in the /en directory. The tuning functions rely on S2 being a 6 position rotary switch NOT a normal rotary POT. Make sure you reference the radio switch diagram .pdf file included - very handy. When flying most multirotors a throttle punch will cause a fairly severe voltage dip which in turn will flag a low or critical voltage warning. If you let off the throttle the voltage returns to a normal range. These false warnings can sound off too frequently. I've setup this model to not provide a voice warning until the voltage is under the "low" limit for 3 seconds. The "critical" warning will not sound until under the critical limit for 2 seconds. This helps avoid false voltage warnings. The low and critical voltage limits are settable in the L22 and L23 Logical switches respectively. Functions just like the "Smooth" except the warnings will be instantaneous as usual. This uses the same L22 and L23 Logical switches for the voltage limits. Sets the flight camera to the high position (for flying fast!). Adjust this via Mix on CH5. Sets the flight camera to the slow flight or landing position. Adjust this via Mix on CH5. Uses the Left Slider position for any cam position you wish on the fly. Taranis will beep every few seconds to let you know your in tuning mode. * Trainer mode is not currently enabled on this model so if you want to use it you will have to turn it on in the model config. I don't fly Horizon mode so it isn't represented here. No reason you couldn't put Horizon on the down position of the SD switch. When enabled the battery voltage and RSSI level will be spoken every 10 secs. You can adjust this timing via SF2 and SF3 in Special Functions.